It was nearing the end of our 9-day road trip through northern Kenya and the end of our tank of petrol. It was still early, but the heat of the day was already covering us in a thick blanket. Our AC had stopped working the minute we left the rental car office in Nairobi, so now we rolled down all our windows, letting a thick layer of dust settle inside the car, on our bags, our boxes of food, our bodies. My travel companion, Ian, poured water on bandanas and we wrapped them around our heads for a few minutes of cool relief. I trailed my finger across my arm and it left a streak of pale skin under golden brown dirt. Filthy, exhausted, and so happy. That was until a group of five or six young men walked out in front of us on the narrow road, surrounding the car, each with a gun over one shoulder. Uh oh. They walk up on both sides — there’s no need to roll down our windows since we already have them open all the way — and we exchange polite, if careful, greetings. They look around our car slowly, taking it all in. Water jugs newly filled and filtered with chlorine tablets, boxes of camping cooking gear and snacks, dirty clothes strewn across the back seats haphazardly. I hold my camera protectively in my lap, a half-fake half-smile plastered on my face, waiting for what’s next. Then, they point stiffly at stuff in the back — smaller water bottles, biscuits, peanuts. We hand the items over quickly. A couple of the guys’ hands feel for the back-door handles, but they don’t try to enter. With our money and electronics completely exposed, that’s what they wanted — food and drink — only what is necessary to survive out in the hot sun. We keep driving. We didn’t talk about it too much, we just kept going, and held onto each other a little tighter in our thoughts. The desert stretched on ahead, with a feeling of forever, flat-topped acacia trees, monstrous anthills, prickly and bare bushes, formidable rock formations, cloudy blue skies. We had left the tiny, red and yellow blooming town of South Horr about an hour ago, bumping along a dirt road that was getting progressively rougher, and driving cautiously because we didn’t want to get stuck in the middle of nowhere with only one spare tire. 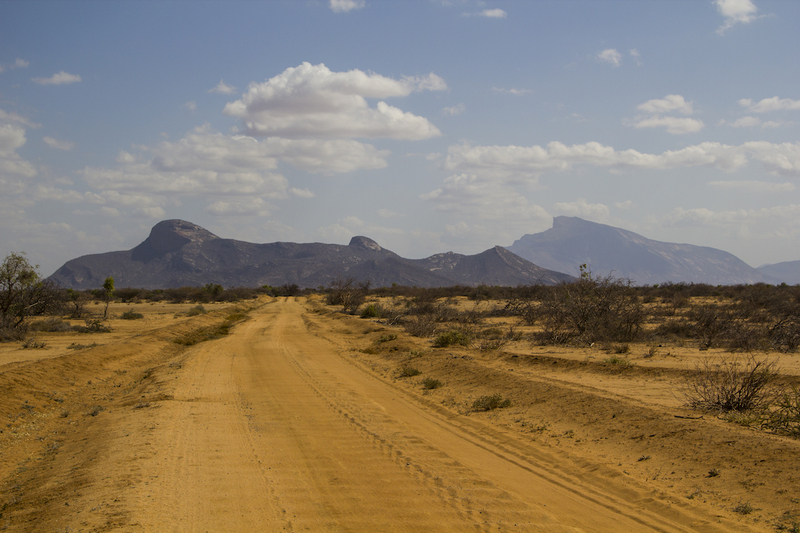 My road trip partner termed our road trip through northern Kenya an adventure of “logical chaos”. It was a beautiful collection of stunning landscapes, huge smiles, and emphatic two-handed waves, hours of being lost, and friends of friends of friends in obscure locations who somehow knew we were coming, and could provide us with one bit of information to keep us on track, as Google Maps isn’t very trustworthy outside of Nairobi. Occasionally on the trip, we would pass by camels lazily turning their heads towards us as if to say disdainfully, “oh, it’s just you,” and ostriches dashing frantically across the road at the very moment we were about to pass them. But now, we seemed to be the only living creatures for miles. 15 kilometers later, we realized (comically, but mostly dreadfully) that we were on the wrong road and had to turn back. Our calm fading a bit, we stopped the car and looked at each other. We would have to pass those guys again, and what would they do if given a second chance, now that they knew exactly what we had and that we were foolishly lost mzungus (foreigners)? I handed my passport and cash to Ian, and he stashed our valuables in different nooks around the car. We braced ourselves and turned around. I turned on the East African music playlist I had uploaded onto my phone the week before, tauntingly upbeat, and tried to relax. Our hasty preparations weren’t necessary. On our way back, only one gunman was still stand-ing on the road, and he was content to take a chocolate bar and leave us alone. A road trip is the ultimate method of seeing a country. You’re able to see many different environments in just a few hours, and begin to understand how people live their lives in response to where they live. Northern Kenya is astonishingly expansive. Parts of the land are hopelessly dry and often near inhospitable. Yet the relationship people have towards their land remains strong despite difficult access to resources — we were intrigued to see lone manyattas (homes made of sticks, cow dung, and earth) with kilometers of barren desert around. Later, a Kenyan friend told me that many families resist leaving the land they’ve owned for generations, even if it means walking for hours to connect with other people. I would never condone the behavior of the young armed robbers we met, but it’s easy to understand that this is how they manage to survive in a climate that’s not very friendly towards survival. We got lost a lot in nine days. It turns out that Google Maps isn’t always trustworthy outside of Nairobi. Our first day, we got lost in a village of wheat fields set on shimmery fire by the setting sun. Everything was green and gold, lush from the forest that ran alongside it. Our car was followed by enthusiastic two-handed waves, shooting out of small kids who laughed and ran after us. Two days later, we drove through obscure parts of the desert where young goat herders also ran after us, but with dry mouths, imploring us for water. We collected water at the top of a mountain in the Ndoto mountain range with our Samburu moran guides, got invited to a manyatta on Lake Turkana to look at a family’s pile of fish drying in the hot sun, and made oatmeal in a cloud forest as an elephant splashed in the lake across from us, the only three souls at Lake Paradise in Marsabit National Park that morning. The road to Loiyangalani (“a place of many trees” in Samburu), a small town on the southeastern coast of Lake Turkana, is of volcanic rock – a striking landscape against the bright turquoise waters. 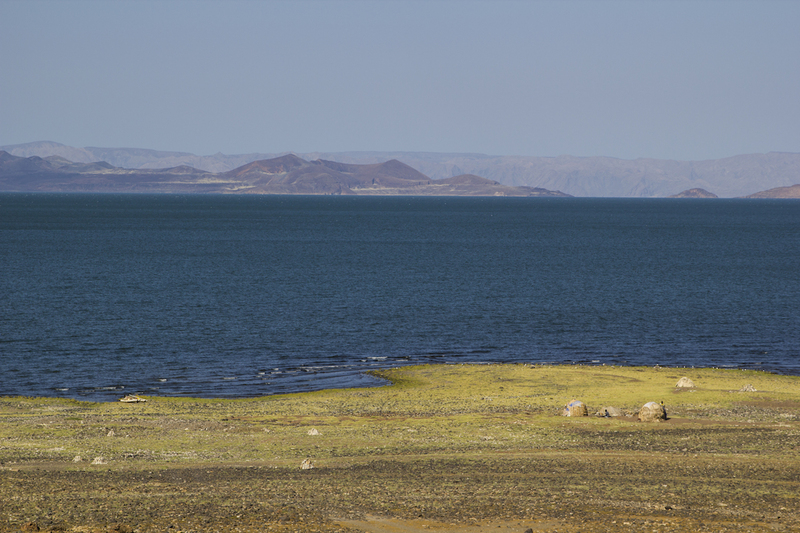 Turkana is the largest desert lake in the world, and a huge breeding ground for Nile crocodiles. 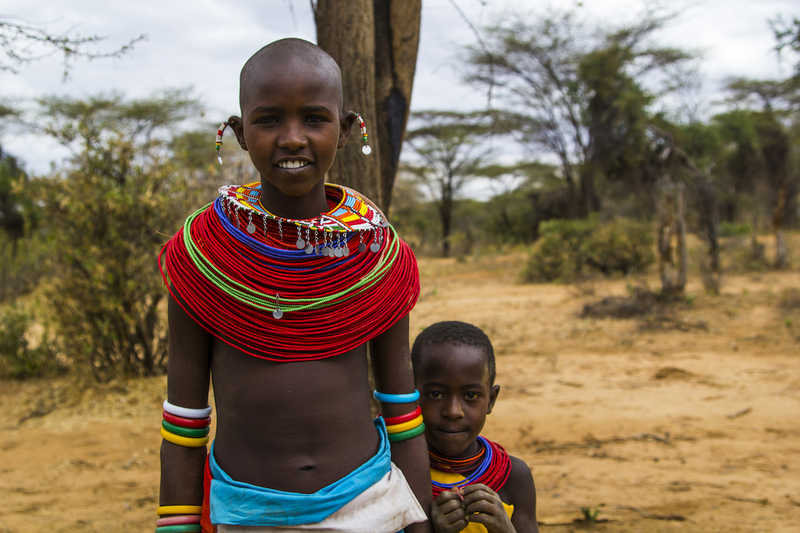 Loiyangalani is home to many tribes, including El Molo, the smallest tribe in Kenya. Most residents live in manyattas, homes made of sticks, cow dung, ash and earth. Manyattas were traditionally created for semi-nomadic tribes like the Samburu to be able to build quickly, and pack up and leave when necessary. The best road trip advice is let yourself get lost, whether that’s physically, in conversation with strangers, or in your thoughts gazing out the window as landscapes roll by. Because we took our time, we could start to understand a little better the relationship people across Kenya have towards their environments, and think about what we want that relationship to mean for us in our day-to-day lives. Here are some of the people we met and faces we saw along our journey. 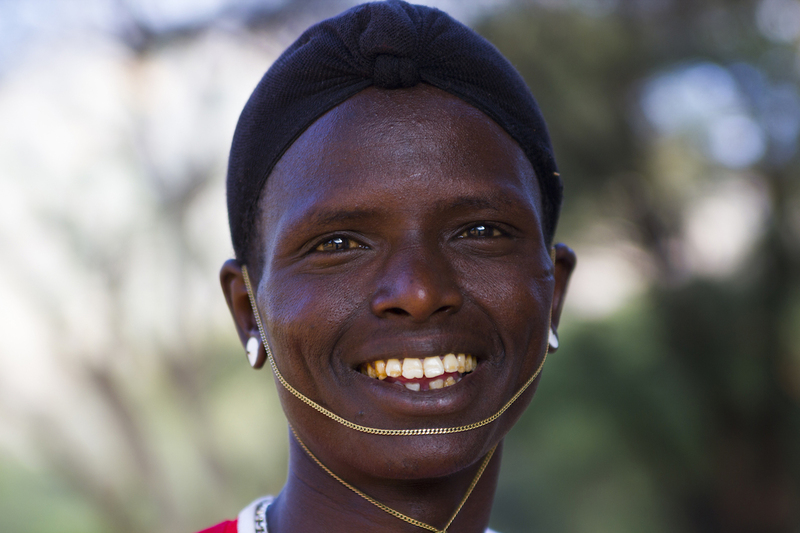 The Samburu tribe inhabits Kenya’s northern plains and is traditionally made up of nomadic pastoralists. Our trip was full of giggling children – from the four naked young boys who scrambled out of a swimming hole as we approached to the kids who followed us for ten minutes at a safe distance before realizing we could be friends and then suddenly were at our side, pulling on our arms eagerly. The village of Ngurunit, surrounded by panoramic views of the Ndoto mountain range, is a gorgeous area of Samburu land. From the first few moments we drove into the town, I was enthralled, and the area never seemed to lose its magic light. 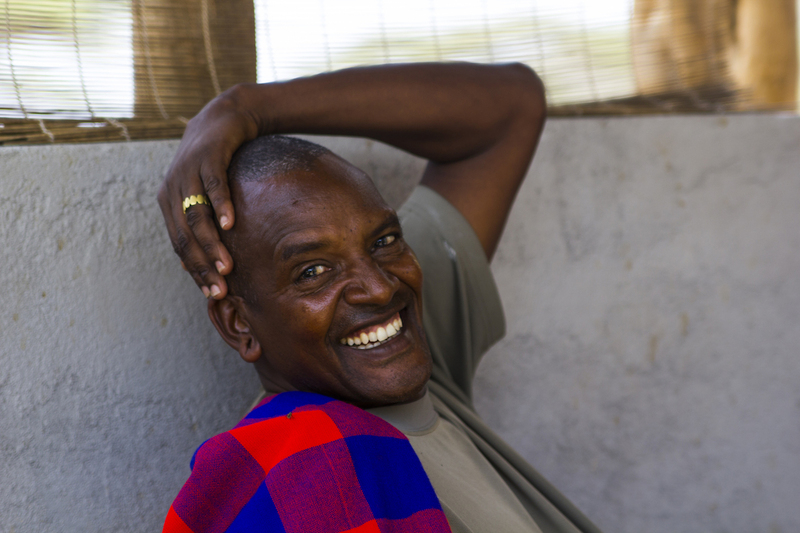 James, our guide, is a Samburu moran (warrior), whose traditional duty is to defend his community and livestock. In the morning, we met him and our other guide David early to begin our full day of trekking up one of the nearby mountains, Laldira. There are no set trails, instead we whacked our way through spiky bushes and climbed up nearly vertical rock face for five hours. 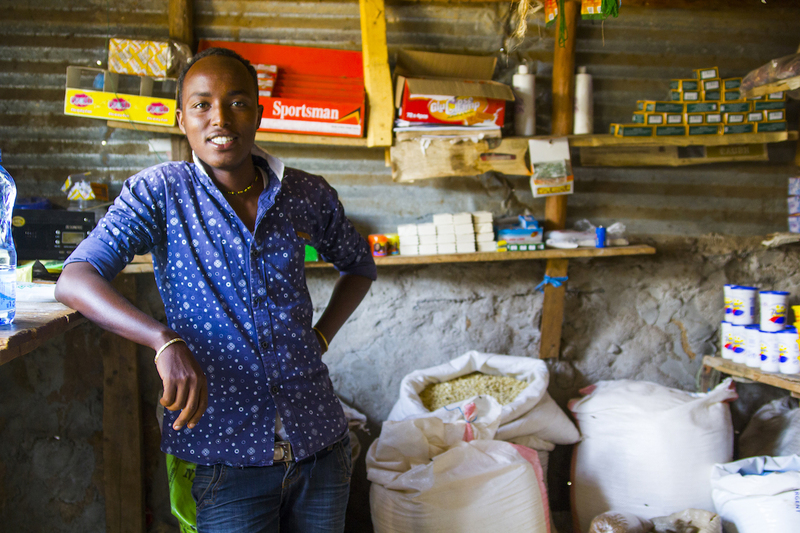 A shopkeeper in Ngurunit town who sold an assortment of goods, from coconut oil to cigarettes. We stopped by his shop to stock up on extra water bottles (you can really never have enough) before hitting the road again, earning this friendly portrait of him. Before climbing Mt. Ololokwe, we camped in Sabache Camp, a gorgeous and almost eerily empty campsite at the bottom of the mountain. With no signage on the main road, we passed the turnoff multiple times, arriving just as the sun set over the golden trees and safari tents. Daniel, pictured here, greeted us eagerly, and from him we learned that there had only been one other visiting group in the past two months. Unconcerned by this, he and the other Samburu men taking care of the camp sat around, enjoying loose tobacco leaves and jokes near our tent until late. We marveled at how many incredible sites like this there must be in Kenya that no one goes to, and why it felt like such a secret. 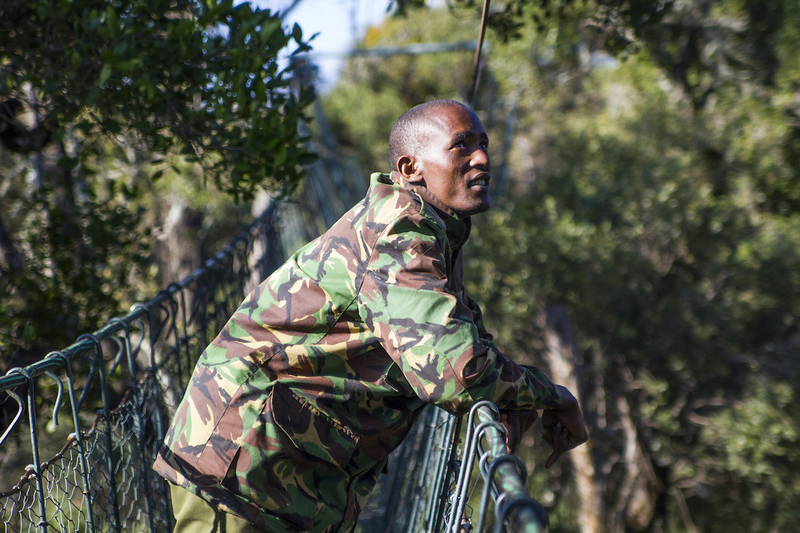 The 450-meter-long lush tree canopy in Ngare Ndare forest is the site’s main attraction. Before walking across it, though, we got woken up in our tent at 7 a.m. “Do you want to see some lions?” Obviously, we did. We jumped in our car with our guide Jaspert (pictured here) and went on our own private safari to a family of six near our campsite. After staring at us intently for 15 minutes, the family slowly walked back into the forest and we were left in our usual awe at seeing such big animals in the wild.